Virtualization seems to be the buzz word these days and although virtualization technology has been used a lot over the last few years many organization are still not fully aware of the significant benefits that come with it. 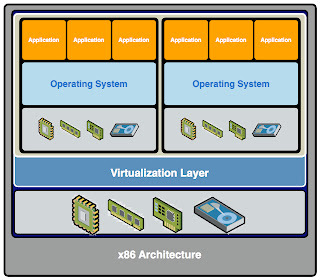 Virtualization is known for various methods, approaches and techniques of creating a virtual (not actual) layer of virtual hardware platform, operating system (OS), storage device, or network resources. Let us first have a look at how virtualization technology actually works. At the most basic level you have your server hardware, then on your server hardware you would expect to have an operating system installed. This is where virtualization comes in, virtualization uses a Hypervisor which simply means an extra layer between the server hardware and the operating system where all the business applications are run. This Hypervisor manages all the resources of the server such as memory, disks, network and CPU and controls which virtual machine (your application server) receives how much of those resources and when. The virtual machine is an independent server which runs on top of the Hypervisor and the number of virtual machines you can run on 1 server is limited only by the servers hardware capabilities. There are some key terms, which you need to know before you go for Virtualization. The term Hardware Virtualization commonly refers to build virtual machine which act like a real machine with an operating system. Here actual machine known as "host machine" is the base machine as hardware virtualizaton took place on it. And virtual machine is known as guest machine. Virtual Machine Manager or the Hypervisor is the software which creates virtual machine on host hardware. 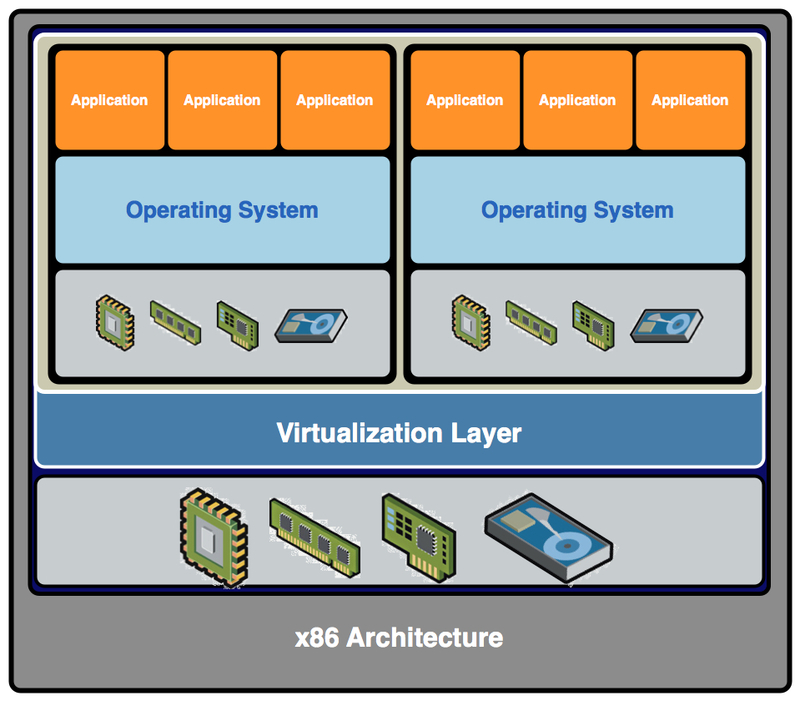 There are three types of Hardware Virtualization. Full Virtulization: Complete simulation of target environment. Partial Virtulization: Partial simulation of target environment. Para-Virtulization: Program of guest machine runs on their own isolated domains and needs modifications to work in this environment. Snapshotting comes handy when you want to start a risky business. This term specially relate to storage devices. Snapshot refers to the state of a virtual machine with its storage devices at an exact point in time. Snapshots can be reverted any time and so as the virtual machine also appear the same when the snapshot is being taken. Teleportation or Migration means to move from one host machine to other having its own hypervisor, without and or little disruption in services. An organization can not afford its system to stop completely in case of any failure. Failover means virtual machine keep on working even if the host machine fails. However, virtual machine keep on working from its last known coherent state, in this case. Microcom IT has been working with virtualisation technology since the early days and is able to provide advice and consultancy services to organisation who are thinking of going virtual. With virtualisation, there are many platforms to choose from and a lot depends on what applications and services you will be running in your organisation. When it comes to selection we can help with selecting the most suitable. Although these are the major technologies that are running within businesses today there are other alternatives available too that enable virtualization for different purposes. Microcom IT Ltd has worked with all three of the above vendors and has implemented solutions for businesses in the UK for a number of years. If you want to find out more, talk to us. I have got a very clear idea about Virtualization. nice theroy now every body should clear about Virtualization. I have lot of confusions about virtualization but now I have clear idea about virtulization.Thanks for share such a nice information with us. It seems an interesting blog to me. I hope you will keep on updating stuff here. This post explain concept of virtualization quite well.